Lisa Ray always looks great in her white ensembles. wasn't it just a few years ago she was heart broken and depressed, well she appears to have recovered well and i have to say that is black resilience. Lisa Ray now has her own TV show on TV one "the real McCoy" and it is pretty interesting. 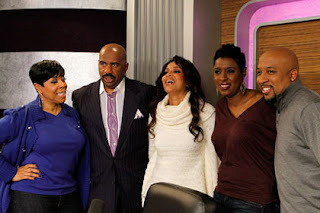 The Steve Harvey Morning Show with their guest Lisa Ray. 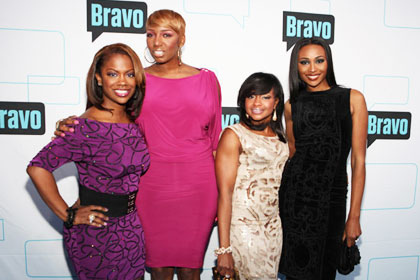 RHOA, one of the best housewives show on Bravo, the women look real glam nowadays. I still say if they want to make the show real they need to see me, cause I feel that I 'm the real housewife of the ATL and my crib bigger than all of there's (self plug), I wouldn't have the patients to be on that show with amount of back stabbing and hating. But I'm not mad at them, celebrity is their calling I suppose.